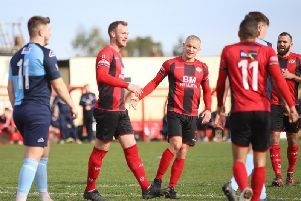 Kettering Town midfielder Ben Milnes relished his return to the starting line-up in their “comfortable” home win over struggling St Neots Town last weekend. The Poppies defeated the Saints 2-0 after two first-half goals – a Rhys Hoenes penalty and a Declan Towers header – while Evo-Stik League South Premier Division Central title rivals Stourbridge fell to a late 3-2 loss at Royston Town, thanks to a late penalty from former Kettering loanee Tom Knowles. Their latest win meant Kettering reclaimed an 11-point lead over the Glassboys that had been surrendered after the disappointing 1-0 defeat away to Biggleswade Town the previous week. And playmaker Milnes, who had been absent from the starting line-up since the beginning of March when Kettering secured a narrow 1-0 win over Lowestoft Town, was happy with his team’s performance. “We keep edging closer, it was a good win for us against a team that sat back and got men behind the ball,” Milnes said. “On a pretty bobbly pitch it was always going to be difficult to try to break them down but we managed to get two early goals in the first-half and that settled us. “In the second-half we didn’t really play well but they didn’t have a shot on goal so it was comfortable in the end. It was important for the Poppies to bounce back after the loss at Biggleswade and Milnes added: “A few strong words were said after Biggleswade game between ourselves as players and then in training on Tuesday. Milnes was happy to be back in the team and was very impressive on his return as his passing orientated Kettering’s attacking play and his crosses from open play as well as free-kicks were dangerous and effective particularly in the first half. “It’s always nice to start and get a few minutes,” he said. Kettering will be looking to move closer to the title when they make the 230-mile round trip to Leiston this weekend. And Milnes is intent on revenge having fallen to a last-gasp loss to the Blues early on in the season, which was the Poppies’ first league loss after opening the campaign with six consecutive wins. “Obviously, the sooner we get the points on the board the better for us,” the midfielder added. at home, so we do owe them one.